If Costa Rica doesn’t bring visions of lush forested jungle, it should. 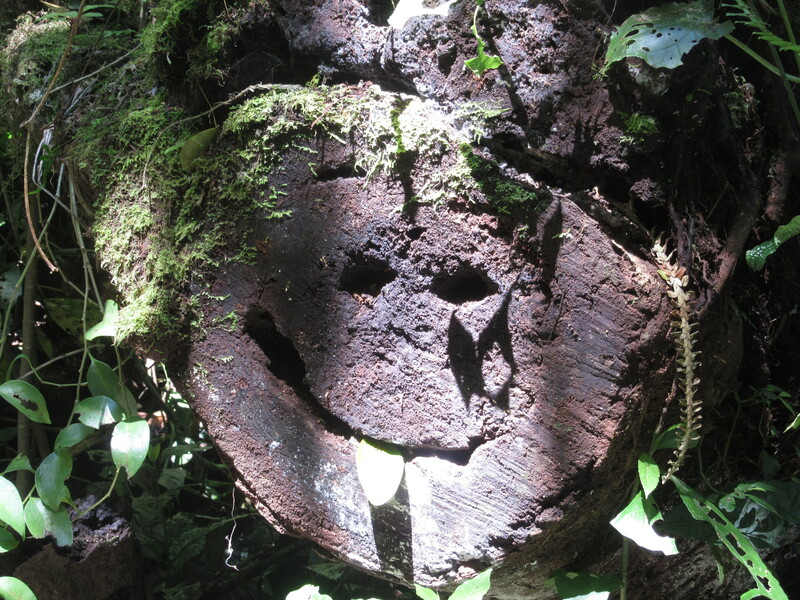 We visited Monte Verde Bosque Nuboso, not a rainforest, but a cloud forest. The distinction between rainforest and cloud forest wasn’t clear until we hiked to the viewpoint and found that there wasn’t one, viewpoint, that is. We were just 30 miles from the ocean, but in and above clouds so all we could see were the treetops fading into haze. No rain, but 100% humidity. The moisture in the air helps the foliage grow…BIG! Monteverde is described as one of the most likely spots to see Costa Rica’s interesting wildlife. Our first sighting: a friendly face, complete with protruding tongue. We were on the watch for koati, tree frogs, and howler monkeys. But they all evaded us. Guides we met along the trails suggested we needed to tiptoe along so as not to scare away the wildlife. This owl butterfly was huge, close to six inches wide. The “eyes” on the wings deter predators. We were far from alone at the reserve. This is a birder’s haven. Guides carry high-powered telescopes on tripods and help visitors spot dozens of varieties of birds. We met one visitor from the U.S. whose business was painting Audubon bird images. Another group of more amateur birders excitedly showed us their excellent photos, all taken by holding iphones up to the eyepiece of the telescope. We scouted the area on our own and heard a lot of birds and spotted a few. Toucan Sam holding a Froot Loop in his mouth? We were on a quest for a quetzal, not the national bird of Costa Rica (which is a very bland-looking clay-colored thrush), but possibly the most famous. Our friend Francene from Brisbane said she saw it not in the wild, but on the currency during her Central American trip. The quetzal note not only appears on the Guatemala bills; it is the country’s unit of currency! The quetzal flies across un quetzal. We were lucky to arrive in Costa Rica during quetzal mating season. In fact, when we purchased our tickets the folks at the reception desk showed us a likely spot for a sighting where one quetzal pair had established a nest. We were in luck. Later we saw another pair in a different area, but far from the trail. We circled back to this spot later and watched the colorful bird grooming and chirping. On the very last trail before we left, a short loop that probably rarely had visitors, Nancy did see an animal. 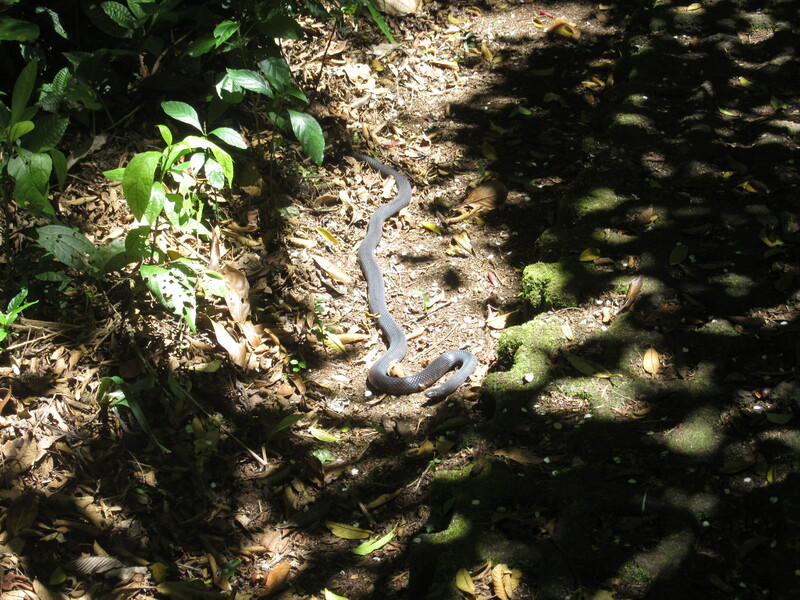 Four guides provided four different names for this gray snake, but all agreed it wasn’t poisonous. Just in case I misunderstood the Spanish assurances that this snake was NOT poisonous, I stayed away. Outside the park is an information area with a gallery of hummingbird art and an outdoor gallery of live art as dozens of hummingbirds flit about from one feeder to another. Very difficult to photograph the rapidly moving wings. Love the color! Apparently hummingbirds do stop flapping at times. Lots of international visitors come to Costa Rica and stay at the full-service luxury resorts. We had one unscheduled night and thought about staying at one of these resorts, but that one night would have cost as much as the whole week at our guesthouse. It had a bigger pool but not worth the extra price. However, Michael did play golf and met up with some friends. Is an iguana considered a movable hazard? From Monteverde we traveled back to one of the San Joses of Costa Rica (There are multiple San Joses, some with an accent, some without. Very important when booking travel!) and visited an active volcano just over an hour from the capital city. Imagine coming across this sight on a hike through the mountains. Here too we found clouds at the top of the mountain obstructing our sight, but this time we did a hike and circled back just in time to see the clouds move from the crater of Poás Volcano to reveal the mudpots and steam rising from a lake. It is so acidic it has been measured at a pH of -0.87. This hot lake is appropriately named Laguna Caliente. The last eruptive activity was in 1954 and scientists say the volcano could blow at any time. As in Hawaii, the volcanic soil is very fertile. The road down the mountain is lined with shops selling fresh strawberries with melted chocolate and sweetened condensed milk (a new treat). We sampled some: quite good! We ate them too quickly to get a photo. Like Panama, Costa Rica is another country where expats flock to enjoy retirement and get off the grid. The lovely guesthouse where we stayed has been owned by a Swiss refugee for nearly 20 years. Next door a grandmother had emigrated from Canada a similar number of years earlier. Visiting with the Canadian grandmother who lived near the guesthouse. She was waiting for the tide to fill her own private pool. One of the best restaurants in the area offered up-scale French cuisine and was run by a chef from L.A. and his family. These very happy refugees had all found locations along dusty, rutted gravel roads many miles from a supermarket or mall. This was a main road from our guest house to the restaurant. Not too bad if you avoid the deep ruts and drive during daylight. The local residents all seemed to know each other too. Enrique, the young bartender at the restaurant at our guesthouse, was the son of the bartender at the French restaurant and his surfing buddies were our waiters at two different restaurants a few miles (but many minutes over rutted roads) away. The beachside restaurant where all the surfing boys worked is called Lola’s. This is Lola, not the original, but the descendent of the pig for which the restaurant is named. We discovered a new international drink perfect for hot weather, the BBC (Bailey’s banana colada). Enrique had never heard of it but gave it a shot and succeeded. We’ll see if the bartenders in Palm Springs can recreate it! Enrique created the BBC just for me. Although our trip to Costa Rica was in March, time has flown (like the resplendent quetzal) and we will be off to Mexico on the blog and Palm Springs in real time. For now, here is a Costa Rican sunset. This entry was posted in Travel Journal and tagged birds, Costa Rica, hummingbirds, quetzal, wildlife. Bookmark the permalink. That drink looks lovely! Who took the bird pics – awesome – the whole thing! We will have that drink in 2 weeks! Michael does most of the pics but I did the quetzal. I found it impossible to get a hummingbird photo. See you soon.